Stage #941 (or thereabouts) of the Independent Publisher’s journey should be a visit to the printers – and that’s where we went to final-proof Road Tripper Eastern Cape Karoo this past week. 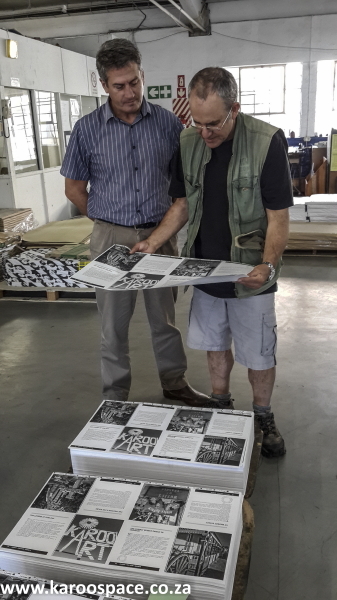 Robert Prideaux of Cadar Printers (left) checking pages with Chris Marais of Karoo Space. It’s a bit of a jittery joy to trek down from Cradock to Cadar Printers in Port Elizabeth, be given a rough dummy to look over and then venture into the business end: the print shop. Be warned, however: if you’re not a little nervous, you’re not paying attention. 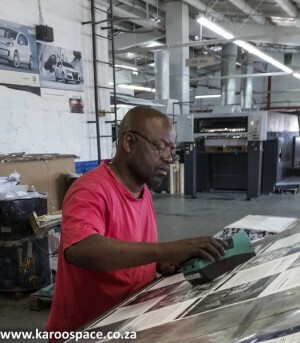 Wiseman Mpahla the lithographer checking ink density on Road Tripper Eastern Cape Karoo. Guided by Cadar’s Robert Prideaux, we found stacks of prepared pages that would eventually become our latest Karoo book. Wiseman Mpahla the lithographer was busy checking the photographs for ink density. 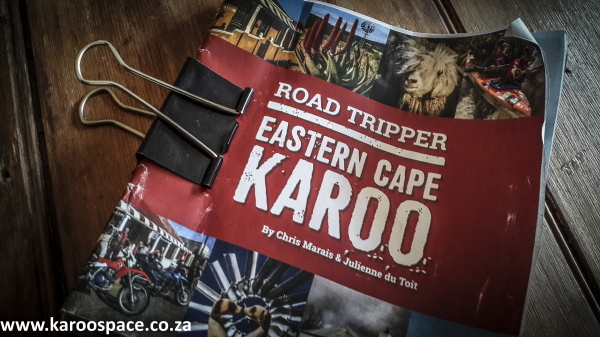 A week from now, a heavy-package courier will pick up at least 500 copies of Road Tripper Eastern Cape Karoo and deliver them to our little warehouse in Cradock. The remainder of the 5 000 print order will follow in a second trip. 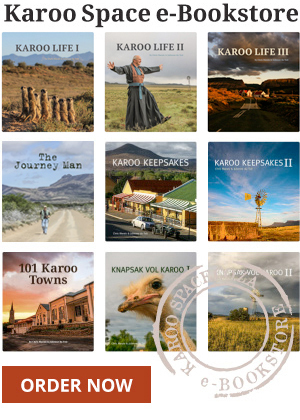 The book joins Karoo Keepsakes, Karoo Keepsakes II and The Journey Man in our indie publishing family. Jules, TwoPack and I then hit the road and go smousing through the region, dropping off signed copies at padstalle, village shops, hotels and guest houses en route. October is Launch Month for the Road Tripper, and we will be all over the place, including a special event in Nelson Mandela Bay. And, if the festival gods smile down on us, perhaps we’ll have a slot at month-end in Richmond Booktown. So looking forward to this, to add to the others in my collection! Keep us posted! Count me in for a copy.